The Leith dockers strike of 1913 was a strike of the dockers of Leith, Scotland from 26 June to 14 August 1913. The dockers were part of the National Union of Dock Labourers (NUDL) union. The strike is said by newspaper of the time to have brought Leith to a standstill. Summary based on William Kenefick in Red Scotland, given by Edinburgh radical historian 'Rory Reid'. The Dockers were demanding an increase in pay( a penny per hour on the day rate), better conditions(an increase in piecework rates for handling 'dirty cargo') , a ban on hiring workers outside of the union and shorter hours. The Leith Dock Employers Association replied by bringing in 450 scabs to break the strike housing them in ships- The Lady Jocelyn and The Paris- owned by the company. They were protected by the local police forces from Edinburgh and Leith as well as others who had been drafted in from Aberdeen, Glasgow, Lanarkshire and the lothians. The Dockers were unable to enter the perimeter wall so picketed in shifts. They were only allowed 6 pickets at a time and always escorted by the police. Questions were raised about the legality of closing a public dock. The authorities argued it was necessary to protect people and propery and those with a valid permit could enter. Soon enough, other workers, the railway workers and seamen joined and refused to scab. The Lothian Miners soon came out in support of the Dockers and the Leith Dockers were supported by other dockers across the east coast of Scotland.The Railwayment and seamen became involved and for the duration of the strike, 200 carters and 600 seamen refused to handle any cargo or work any boat operated by scabs. The Lothian Miners backed the dockers, despite the fact the coal embargo imposed by the NUDL directly affected them and caused considerable unemployment. Dockers at Grangemouth,Granton and Kircaldy all refused to handle cargo diverted from Leith. In July there was a massive outburst in strikes at the time being described as a "strike epidemic" after female ropeworkers also went on strike followed by shipmasters. This led the Leith Observer to remark “All of this has brought about a state of matters unprecedented not only in the history of Leith, but in any part of the country”. The Leith Observer reported this was unheard of and that the scabs brought in to do the strikers jobs were unable to match the speed of those on strike and were costly in terms of upkeep for the employers. This tense situation encouraged rioting on the nights between the 16th and 18th of July. The Leith observer commented that the only trade doing brisk business was the glaziers. The violence grew more intense and the scabs were often attacked while there was an unsuccessful attempt to blow up the perimeter wall with gelignite. From 16th to the 18th of July there was mass rioting. Those workers brought in to replace the strikers were attacked and there is said to have been an attempt to blow up the perimeter wall. During this time naval boats were sent in at the request of the authorities but this only led to hostility from sailors and marines who didn't want to be used in this way. Questions were raised in Parliament about the use of ships to attempt to break up the strike. The response given was that they came as a form of aid but were found to be unnecessary. MP's expressed unease about the secrecy surrounding the use of the ships. Union officials attempt to control the situation but to no avail. The local press reported sympathetically that the police had often provoked the situation. 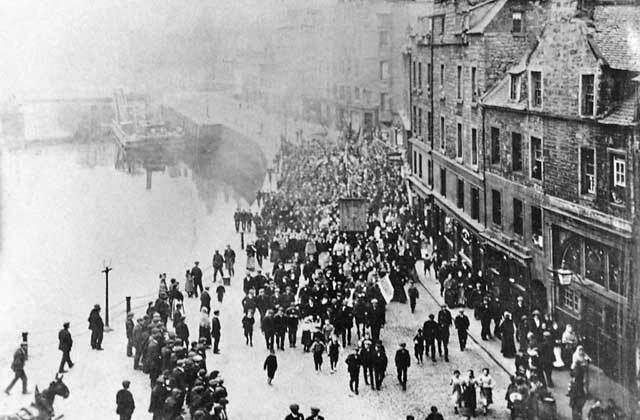 Around the middle of July, Edinburgh Tramwaymen and Boilermakers went on strike too and together on 20 July 1913 held a demonstration with dockers, seamen,firemen and other trade unionists. Local paper, The Scotsman reported there was 3,000 dockers, 600 firemen and sailors, 500 tramwaymen, 150 boilermakers, mill girls, and 350 children of the striking workers led by two labour school board teachers, all in all totalling about 4,600. During the procession, there was banners calling for a living wage and protesting the use of force. A loaf of bread painted green to look mouldy was held high which the strikes suggested was symbolising their share of profits made. The dockers and tramwaymen separated with the dockers and others heading along to Leith Links. Once there speeches were made. French Anarcho-Syndicalist Madame Sorgue spoke. A later speaker suggested the solution lay in electoral politics and advocated voting for the labour party in upcoming elections. James Airlie from the Boilermakers union spoke pointing out that the army had been used more times during the strike-20 times he claimed- than during the war. The tramwaymen strike was called off on August 2 but they along with the Amalgamated Society of Engineers(ASE), the Leith and Edinburgh Labour party councillors and Edinburgh and Leith Trade Councils pledged financial support to the continuing dockers strike. By the 6th week of the strike, those charged with rioting were up in court and were soon found guilty. Local paper, The Leith Observer under the cover of a pseudonym ("Leith Laddie") lambasted the decision. The strike finally ended on 14 August when James O' Connor Kessack informed a mass meeting of dockers gathered at Gaiety Theatre that more scabs ready to cross the picketline were coming from Newcastle. Advised by the leadership of the NUDL, the assembled mass meeting voted by a large majority to end the strike but it came as a surprise to all because no one expected it to end so suddenly. The Dockers returned to work on the same conditions as before. As things returned to normal, many faced court for their part in the riots. The Strike is covered in 4 pages of the book Red Scotland. Amended 26/10/2018 to say I should've mentioned earlier that the real author of this is 'Rory Reid' whose kind permission I received to republish it. Thanks for posting this up! Just a couple of things, who is the author? As really we need to have an author credited. And I wasn't sure what this sentence meant: "Questions were raised in Parliament about the use of ships to attempt to break up ships"
was it meant to say that or did it mean "the use of ships to attempt to break the strike"? Thanks for posting this up! Just a couple of things, who is the author? I took this with slight alterations from the Book Red Scotland. I will add that in. As really we need to have an author credited. And I wasn't sure what this sentence meant: "Questions were raised in Parliament about the use of ships to attempt to break up ships"
The latter. My fault. Small typo. This text was written by my friend 'Rory Reid' as a slightly edited version version of William Kenefick. Rory had previously said it didn't matter about crediting him. he and Kenefick deserves the credit. I'll add both names in.